Today Chamilo, a new e-learning & collaboration software project, was announced. Chamilo is a fork from Dokeos. Over the last years, the Dokeos community seems to have grown much faster than the Dokeos company. Seen from the perspective from at least many community members, the community wanted more freedom, while the company took more control. Free Software protects the freedoms of both users and developers. 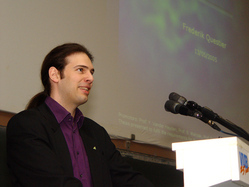 These freedoms allowed the original Claroline author Thomas Depraetere in 2004 to fork Claroline into Dokeos, and these freedoms allow the community now to fork Dokeos into Chamilo. Maybe that’s more competition. But in the Free & Open Source Software universe competition most often leads to survival of the fittest and stronger projects! Still, with these 3 Open Source projects now sharing a common history and code base, I would hope for some collaboration opportunities! I will be interpreting your conference at Universidad de de Cuenca on Wed and Thu next week. I have reviewed some of the material in your website in order to be familiar with the topics you will be presenting here.